3. Does not force the roller on to your skin, only apply mild pressure? Roll the tool in up-down, left-right and in diagonal motions 4 to 8 times each area. 4. Wash the roller under hot running water and the dip in alcohol after each use and let air-dry. When the tool is completely dry you can store it in a plastic container to avoid damage between uses. 5. This product can be used repeatedly but is strictly for personal use. 6. Safe for home use. 1. Do not use on the following skin conditions: contagious skin, active acne, psoriasis, and infections. 2. It should be stored in the supplier plastic box for maximum hygiene and safety after use.  Why choose The Adelie Titanium Skin Care Tool?  [BUY QUALITY WITH CONFIDENCE]: 100 % Customer satisfaction guarantee when you buy from the seller "THE ADELIE" which is the authorized brand of this product!!! If you buy from other seller with the fake item, then we will not be responsible for that!!!  [SAFE AND HIGH GRADE SKIN CARE TOOL]- You will get this skin care tool (0.25mm) covered in a protective case. The Adelie face care tool is safe for home use. 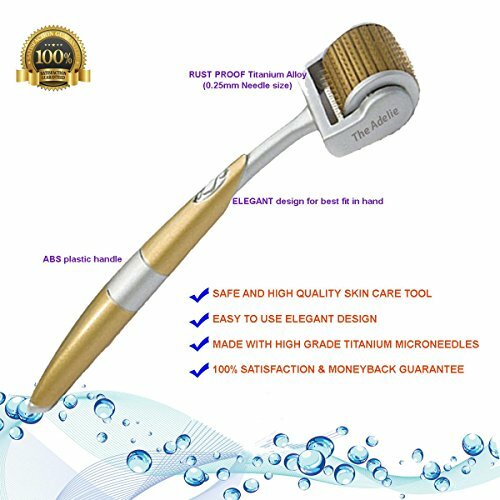  [HIGH QUALITY & EASY TO USE ELEGANT DESIGN]- The Adelie face care tool is made up of high quality ABS plastic and RUST PROOF titanium alloy (0.25mm). Easy to use golden elegant design.  [EASY TO USE]- It can be used at home at your own convenience. For personal use- Do not share-well suited for beginners.  [GREAT SKIN CARE TOOL]- Get dramatic beauty results,Radiate Your Beautiful Skin. If you have any questions about this product by The Adelie, contact us by completing and submitting the form below. If you are looking for a specif part number, please include it with your message.